As an employer, what are GreenJOBS requirements to post my job listings? Jobs should be fair and respectful. You can be involved in any economic sector (e.g. NGOs, agriculture, industry, services, administration…) but it is key that your organization supports green initiatives such as our planet preservation or environmental quality for your staff. The concept of green jobs summarizes the transformation of economies, workplaces, enterprises and labor markets into a low-carbon, sustainable economy that provides decent employment opportunities for all. I’ve registered to the Professional Green Plan and was able to post my first job listing. But how do I add a new job listing? You only need to follow the “Quick Links” tab under “Employer” main menu on the top navigation bar then click on “Post a job”. You can also follow the “Manage Jobs” and duplicate one of your existing jobs then make the appropriate changes. I’m under my account and cannot see the Job options. Why? Your account only contains information about your profile (address, password…) and your orders. To manage your jobs, follow the “Quick Links” tab under “Employer” main menu on the top navigation bar. What is the GreenJobs Programme? The GreenJobs Programme works towards an environmentally sustainable social and economic development. It promotes worldwide the creation of green jobs as a way of generating decent employment and income opportunities with a reduced environmental impact and an increased ability to cope with the challenges of climate change and scarce resources. To do so, the programme follows two main strategies: on one hand, it addresses the employment and social dimension of environmental policies to ensure decent work to present and future generations. On the other hand, it mainstreams environmental concerns into the world of work to change consumption and production patterns. At national level, the programme operates in many different countries and on a variety of issues. At the international level, the programme engages in international policy debates on climate change and sustainable development and builds, together with its partners, a substantive knowledge base on the social dimensions of environmental issues and climate change. What are green jobs according to us? Green jobs are decent jobs in any economic sector (e.g. agriculture, industry, services, administration) which contribute to preserving, restoring and enhancing environmental quality. Green jobs reduce the environmental impact of enterprises and economic sectors by improving the efficiency of energy, raw materials and water; de-carbonizing the economy and bringing down emissions of greenhouse gases; minimizing or avoiding all forms of waste and pollution; protecting or restoring ecosystems and biodiversity; and supporting adaptation to the effects of climate change. For GreenJOBS, the concept of green jobs summarizes the transformation of economies, workplaces, enterprises and labour markets into a low-carbon, sustainable economy that provides decent employment opportunities for all. What is meant by the green economy? There is no unique definition of the green economy. Main characteristic of the concept is the acknowledgment of the economic value of natural capital and ecological services and the need to protect those resources. Most definitions include not only environmental aspects but incorporate the more holistic approach of sustainable development. Environmental sustainability, social justice and locally rooted production and exchange of goods and services are therefore elements that can be found in most green economy definitions. What implications will the transition to a green economy have on employment? In general, it can be said that the shift to a greener economy is and will continue creating employment across a range of sectors. According to the new ILO/UNEP/ITUC/IOE report “Working towards sustainable development”, most studies indicate employment gains in the order of 0.5–2 per cent, which would translate into 15–60 million additional jobs globally. Job losses, caused due to the shift to a greener economy, are expected to occur in some parts of the economy. Up to 1 per cent of the workforce in industrialized countries (the countries with the expected biggest impacts on their labor markets) is likely to be affected by the transition between sectors of the economy. Movements of workers between enterprises are expected to be ten times larger. However, these impacts would still be small compared with those associated with globalization experienced in recent decades. In general, it can be said that transitions to a green(er) economy have the potential to create millions of jobs. But, they are also likely to lead to downsizing in emissions-intensive industries. It is difficult to predict the exact impact as national realities differ. However, most scenarios suggest the net effect will be positive. Countries already moving towards the green economy are witnessing these impacts. A greener economy is not inclusive and socially sustainable by default. Social and labor market policies will need to complement economic and environmental policies to buffer the downside risks of transitions to a green economy. Positive progression at national level will also depend largely on policy coordination and prior planning including retraining of workers and upgrading of skills. Special focus needs to fall on young women and men who need to be equipped with the right knowledge and skills to be successfully integrated into the green economy. Skills shortages for green jobs, why does it exist and how can it be tackled? The transition to a green(er) economy requires new skills. Skills needed for the newly emerging jobs and skills needed for the adjusted existing jobs. Without a suitably trained workforce the transition will be impossible. Skills gaps and shortages are already recognized as a major bottleneck in a number of sectors, such as renewable energy, energy and resource efficiency, renovation of buildings, construction, environmental services and manufacturing. The use of clean technology requires skills in technology application, adaptation and maintenance. The availability of workers and enterprises with the right skills for green jobs plays not only a critical role in initiating the transition to a green economy, but also in enabling a just transition that ensures social inclusion and decent work. Employers investing in new technologies need to be able to find workers with the right skills. Environmental awareness needs to be part of education and training at all levels. Countries need strategies that combine energy, environment, education and skills development objectives and policies. Effective social dialogue, coordination among ministries and communication between employers and training providers will be key for the success of these strategies. Public-private partnerships, using governments’ and business’ resources and knowledge have proven effective in most cases. Skills requirements mappings allow the elaboration of in-depth programmes for potential skills upgrading and the redesigning of national vocational training and education schemes. The overall objective is to merge skills development with green policies and investment. 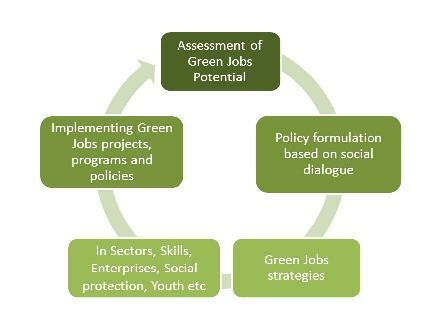 How does the Green Jobs Programme promote green jobs at national level? Constituents are increasingly interested to know about green jobs, particular in a context of high under- and unemployment. Their question is whether there are new opportunities for growth and job creation, and if so, how these can be used best to increase social inclusion and reduce poverty. Pilot projects at sector and local level on green entrepreneurship, green business, vocational training, employment-intensive infrastructure, etc. What is the role of social dialogue? Social dialogue is defined as negotiation, consultation, or simply the exchange of information between or among government, employers, and workers´ representatives on issues of common interest. Workers’ and employers’ representatives are called social partners. In general, a democratic social dialogue space facilitates information exchange and the sharing of demands and concerns. It allows for a shared assessment of the issues and provides the opportunity to better understand the challenges and opportunities of the different actors. The understanding of the different perspectives allows for consensus-building and makes it possible to anticipate and manage possible conflicts. In recent years, trade unions and employers’ organizations have started to recognize environmental demands and issues as an opportunity to create more and better jobs and both workers and employers are increasingly participating in environmentally policy making. The participation of social partners in policy dialogues is key to ensure a just transition as they are voicing those who are most directly involved and affected; employers and workers. Social dialogue between governments, workers’ and employers’ organizations is essential not only to ease tensions and support better informed and more coherent environmental, economic and social policies, but for all social partners to be involved in the development of such policies. Government assistance to both workers and enterprises will be necessary in many cases. Main international environmental processes (e.g. UNCED, Johannesburg Summit, Agenda 21) have also recognized participation and social dialogue as key elements of sustainable development and established respective mechanisms. That are the gender issues of green jobs? Economic activities of women, particularly of poor women living in rural areas, are more dependent on natural resources. Changes in the environment will therefore have a direct impact on women and their quality of life. Women are among the poorest of the world and are recognized as one of the most vulnerable in face of environmental degradation and climate change. Different research identified that worldwide there are strong gender gaps in access to resources and income-generating opportunities, in decision making positions at local and national levels and in access to education and human development. Those inequalities tend to exclude women from the short and long term benefits that the green economy can provide. Green jobs creation in any sector requires new competencies and skills. Those skills needs can be anticipated by making adjustments to existing education and training systems and by creating new training opportunities. These can be an important stepping stone for giving youth, women and other disadvantaged groups access to the job and income-generation opportunities that will be created in a green economy. Does my community have the potential to create green jobs? Green Jobs Program pilot projects at local level demonstrate that there are many opportunities to create decent work with a reduced impact on the environment. Renewable energies: Training on solar panel installation and maintenance has proven to be very effective in rural areas in Bangladesh. The training allowed the participants (mainly women) to use solar power in their own households and start small businesses by providing installation and maintenance services to other community households. Sustainable construction: According to a ILO study conducted on the subject in the Gaza Strip, sustainable construction has the potential to create new job opportunities and improve working standards while improving the efficiency of materials, energy and water use in construction and buildings. Sustainable construction uses local and recycled materials, exploits renewable energy and rainwater and produces less sewage water and pollution. Sustainable agriculture: Changing the production patterns in agriculture allows not only to reduce the impact on the environment, but also to better cope with a changing climate including floods, more severe droughts etc. Sustainable agriculture is labor intensive and can therefore create more job opportunities in this sector. Key elements of sustainable agriculture are soil fertility management; more efficient and sustainable water use; crop and livestock diversification; biological plant and animal health management; and appropriate farm-level mechanization. Adequate training in those key elements allows farmers to implement those green practices. Green enterprises: The Green Jobs Program concept to promote green enterprises consists of two main strategies, (i) the greening of existing enterprises focusing on the process and (ii) the creation of green enterprises which produce green goods and services. Both strategies have proven to be very efficient particularly for small and medium sized enterprises. Small adaptations in the production processes (use of renewable energy, water treatment, recycling measures etc.) allow reducing significantly the environmental impact of enterprises. Training for green entrepreneurship in for example China and Kenya has resulted in new business ideas particularly among youth.